Tie your code into knots and make the hackers cry. 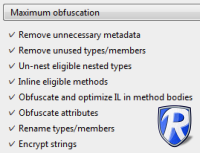 Rummage is a .NET obfuscator. Fully featured, yet reasonably-priced. Rummage lets you deter software pirates by making your .NET programs harder to decompile, reverse-engineer, hack or steal.